British scientist Stephen Hawking has had to miss a symposium to mark his 70th birthday because of ill health. Professor Hawking was discharged from hospital only on Friday, Professor Sir Leszek Borysiewicz, vice-chancellor of Cambridge University, told the event. A recorded speech was played to the symposium, at the university, instead. In it, Prof Hawking, who was diagnosed with motor neurone disease aged 21, urged the continued exploration of space "for the future of humanity". He used his talk, entitled A Brief History of Mine, to warn that the human race would not "survive another thousand years" without beginning to colonise other parts of space. As well as running through his personal history and pronouncements on the future of the human race, he also used the conclusion of the speech to call on people to "be curious". "Remember to look up at the stars and not down at your feet. Try to make sense of what you see and wonder about what makes the universe exist," he said. He went on to say it had been "a glorious time to be alive, and doing research in theoretical physics". "Our picture of the universe has changed a great deal in the last 40 years and I am happy to have made a small contribution. "The fact that we humans who are ourselves mere collections of fundamental particles of nature have been able to come this close to an understanding of the laws governing us and our universe is a great triumph." The auditorium at Cambridge University was packed with leading scientists, businessmen and members of the public including entrepreneur Richard Branson and model Lily Cole. Prof Hawking communicates using an optical device that interprets twitches of his cheek muscles to point at different words on a computer that can then be voiced using a speech synthesiser. Currently he is able to select about a word a minute using the system, making the task of writing speeches, such as the 30 minutes he wrote for Sunday, an arduous and impressive task. However, work is under way to attempt to improve this system. This week a team from chip giant Intel - who developed a lot of the technology the professor uses - will arrive in Cambridge to assess whether a new approach can be used. Justin Rattner, chief technology officer at Intel, said the team were considering new options to allow Prof Hawking to communicate including brainwave analysis and 3D facial recognition cameras. But any new technology would have to be approved by the notoriously stubborn academic, who reportedly does not want to learn a cumbersome new system and wants to preserve his distinctive electronic voice. "That's the easiest thing. He has had the option for many years for newer and better voices. But in many senses that voice has become his voice," said Mr Rattner. Hopes had been high that Prof Hawking's health would allow him to attend Sunday's gathering. But when Sir Leszek opened the event, he announced that Prof Hawking would not be able to attend. The vice-chancellor went on to say that if Prof Hawking was listening he wished him a very happy birthday. At that, the audience reacted with long and warm applause. The public symposium also heard from Astronomer Royal Lord Rees, this year's winner of the Nobel Prize for Physics, Saul Perlmutter, and one of the world's leading theoretical physicists Professor Kip Thorne. Prof Thorne paid tribute to Prof Hawking, saying he was a "dominant figure in research and the communication of that research". "And overcoming his severe disability provides inspiration for us all," he told the BBC. He also said Prof Hawking's words in his speech were spoken out of modesty. "He is one of the great figures of the 20th Century and continues to be a major contributor in the 21st," he said. Prof Hawking also had to miss three days of a science conference, entitled The State of the Universe, held in his honour. Despite Prof Hawking spending most of his life as a wheelchair user and being able to speak only through a computer, the theoretical physicist's quest for the secrets of the universe has made him arguably the most famous scientist in the world. As well as transforming aspects of modern physics, he has also found a new audience for his theories when he published A Brief History of Time. The best-seller, published in 1988, went on to sell 10m copies - although many people famously admit to never finishing the tome. "Not everyone may have finished it or understood everything they read," Prof Hawking told the Cambridge audience. "But they at least got the idea that we live in a universe governed by rational laws that we can discover and understand." 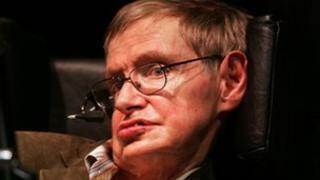 Many experts say Prof Hawking has defied medical science by reaching the age of 70 with motor neurone disease, a degenerative illness that usually proves fatal within five years of diagnosis.